FOUR COMETS RISING IN THE EAST? Below is photos from Spaceweather.com. From left to right we see first Comet LINEAR X1, Comet ISON, Comet Encke and then the brightest of them all to the far right is Comet Lovejoy. These can been seen in the east before dawn. Bring your telescope or binoculars for best view of all of them. Comet Lovejoy should be able to be seen with a naked eye. This is extremely rare to have 4 comets for our back yard viewing! Comets have been very quiet in our century and the first comet of this Century was Pan-Starrs, last February. That comet was in our viewing when Pope Benedict XVI resigned and meteorite exploded over Russia. From historical records, comets have been known as a bad omen and they often appear several years before a major war or natural disaster. Comet ISON is not going to be as big as it was originally expected, but will still put on a good show. ISON is .12 – 1.2 miles across, compared to Hale-Bopp which was 19 miles across. 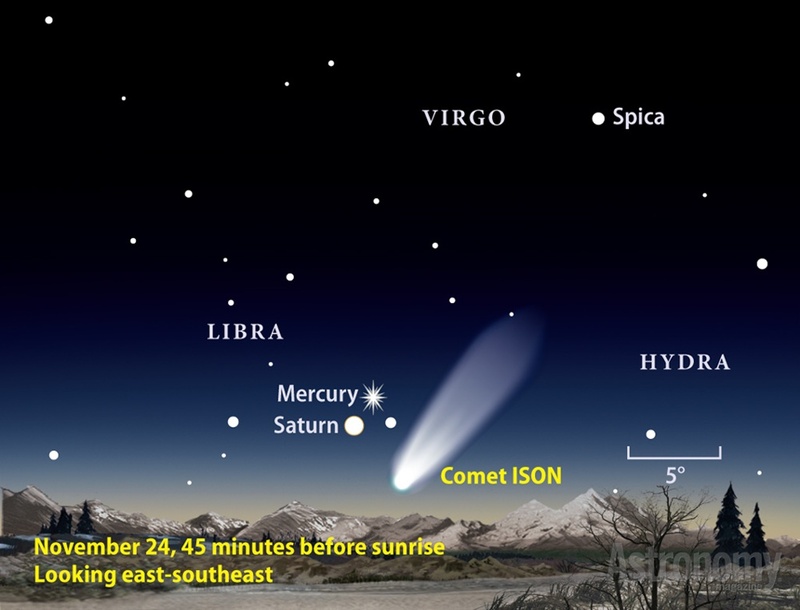 At Thanksgiving, Comet ISON will be closest to our earth, 40 million miles away, traveling at 425,000 miles an hour. Below is a great viewing guide from Astronomy.com for our November 24 pre-dawn viewing. Biblical guide to what you are viewing. I put the Hebrew names in italics. SPICA, Tsemech, ‘the Branch’. In the Bible Tsemech (H6780) is exclusively used for the Messiah.